Taxco, a Mexican city in the state of Guerrero, is well known as a center for the making of jewelry. 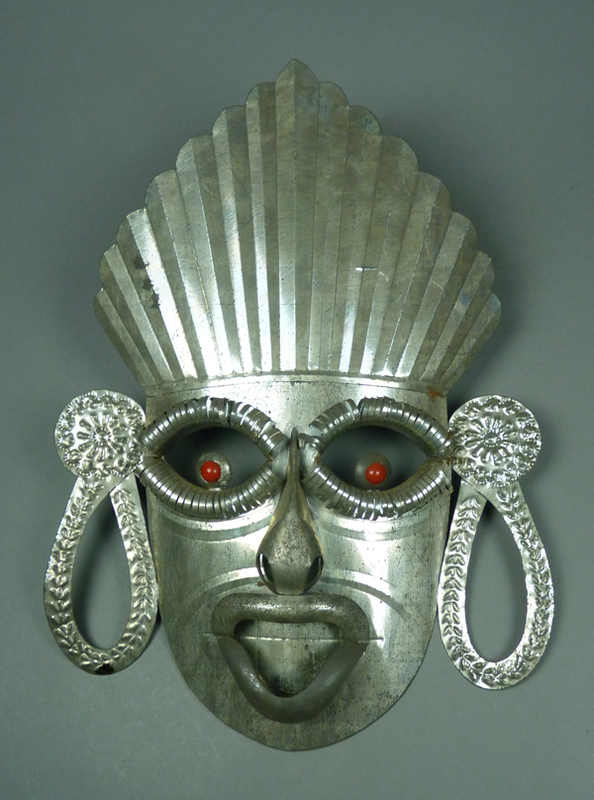 By the 1950s it had also become the source for tin masks that were openly made and marketed for tourists. After two posts about traditional dance masks that were found on EBay™, I thought I would share some tin tourist masks from the same source. 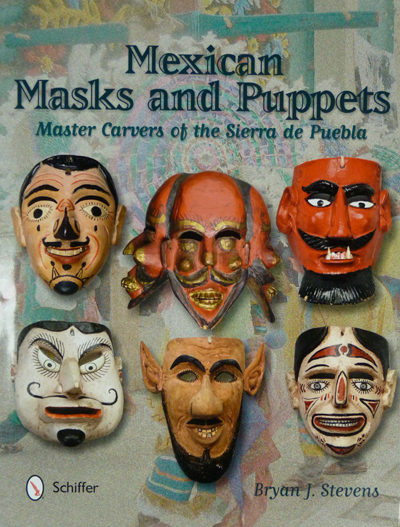 Because I have long been interested in tinsmithing, I collected these masks as folk art. Here is a typical example. This mask is 16 inches tall and 12 inches wide. It is constructed from a number of typical elements, including the face and applied features such as the ears, and/or earrings, nose, lips, headdress, and glass marbles for the eyes. This winter I was pleased to find a very attractive mask on EBay,™ one that I recognized as similar to some that I had seen in two related books. 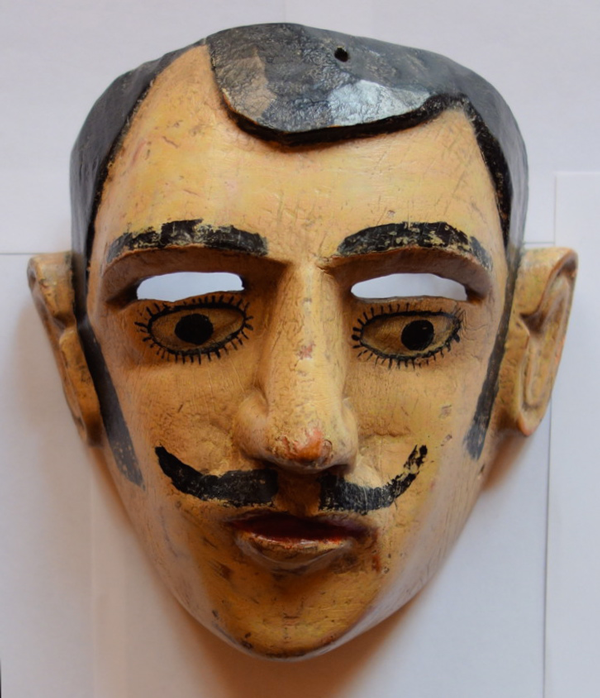 It came with some information—”Vintage Mexican Wooden Mask used in the Moros & Cristianos dance in Sacatlan Puebla. This mask was purchased in 1981.” So we have the name of the place where this mask was danced (actually Zacatlán, Puebla, which is west of Teziutlán and on the western edge of the Sierra de Puebla mountain chain), the name of the dance, and we know that it was made prior to 1981; it is at least 35 years old. Although I found a reference to the performance of the Moros y Cristianos dance in Zacatlán, I was unable to find any video or image of this performance. I find this a very handsome mask, and call your attention to the carefully carved eyes. There are cracks in the wood, but I doubt that they will endanger the stability of the mask. Occasionally I have devoted a post to a particular mask that I found on EBay™. 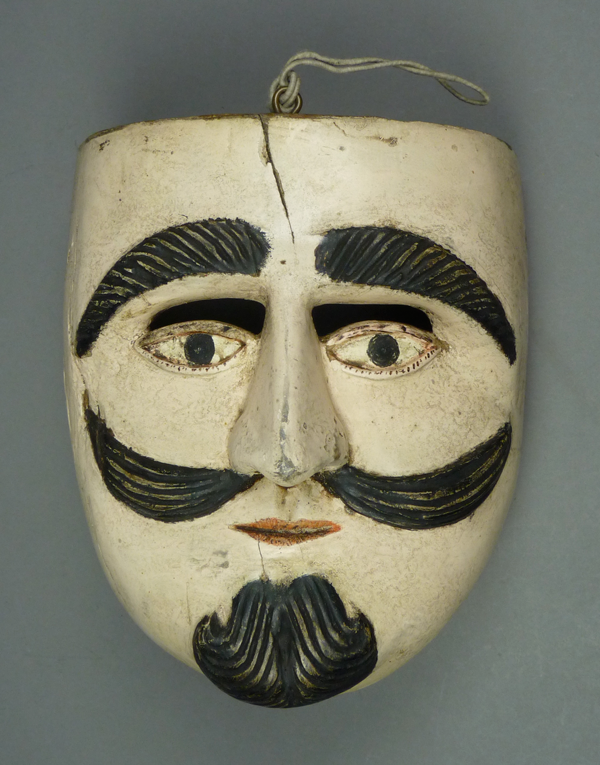 Today I would like to discuss a handsome Huehue mask that was found there by Helmut Hamm, a mask collector who lives in Berlin, Germany. It has a dramatic hairline. When I visited Jaled Muyaes and Estela Ogazón in Mexico City, in November 2001, Estela made a sad announcement—all building activity in the city had ground to a halt. The reason? Jaled had bought up all of the tools! Joking aside, Jaled had been collecting antique tools for many years, but in the late 1990s he began to construct sculptures by welding worn recycled tools into columns or other arrangements. These were very attractive; in his family courtyard one saw columns of pickaxes and totem poles of shovels. 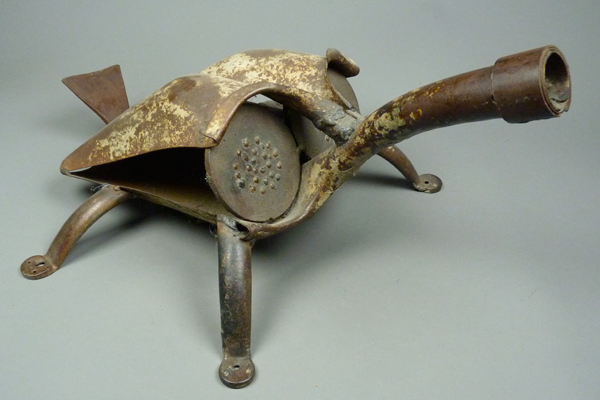 He made small iron animals that he called “bichos,” Spanish slang for bugs or critters. He made masks from shovels; other tools provided the features. Here is one of those critters.